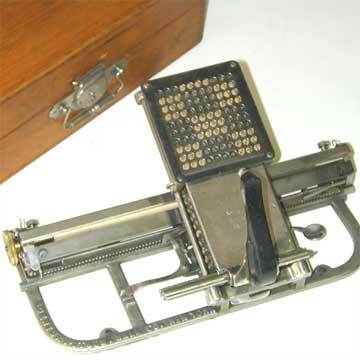 This portable version of the popular Hall index typewriter doesn't seem to have ever been produced. There are no ads known for it, nor is any other example of the machine known, apart from the one shown here with an apparently fake serial number of 150. The name Century appears on the cast iron frame of this interesting little machine. Although the resemblance with the other Hall typewriters is obvious (see for instance the brass platen knob) there is one major difference. Typical for all Halls is the flat rubber type that is located under the mechanism. Here, the type sheet is rolled around a cylinder, to save space. The writing mechanism could be token off the machine to store it in the small wooden carrying case. A number of parts of this machine are stamped with the number 50, although the serial number 150 is stamped into the top shield.